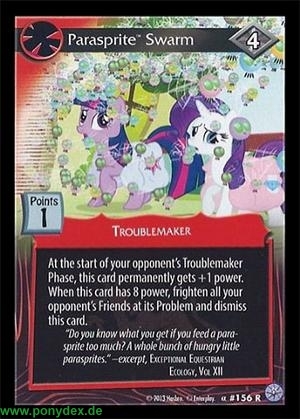 At the start of your opponent's Troublemaker Phase, this card permanently gets +1 power. When this card has 8 power, frighten all your opponent's Friends at its Problem and dismiss this card. "Do you know what you get if you feed a parasprite too much? A whole bunch of hungry little parasprites."